Johann Michel Saint Peray Blanc has a shining golden yellow color. The wine is aromatic with white flowers such as acacia and honeysuckle. In the mouth, you will find some lanolin flavors as well as apricot and yellow ripe peach. The finish is long, delicate and balanced. It is waxy and very White Burgundy like. 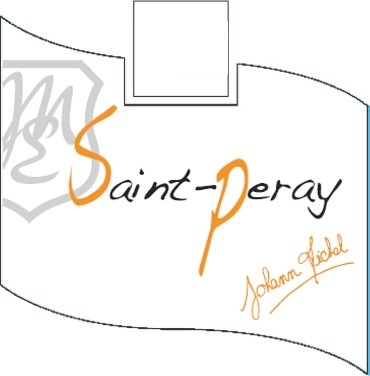 Johann Michel owns 0.5 hectare (1.24 acre) of Saint Peray. All planted on Granitic soil, with some schist vein. Aromatic with white flowers such as acacia and honeysuckle. In the mouth, you will find some lanolin flavors as well as apricot and yellow ripe peach. The finish is long, delicate and balanced. Waxy and Burgundy like being the most important part of tasting wines in Saint-Peray. Most whites are thin and lacking interest. "The 2017 Saint-Péray Blanc from Michel checks in as an even split of Marsanne and Roussanne that was brought up all in neutral oak. It’s an outstanding wine as well as a terrific value. Notes of orchard fruits, honeyed minerality, white flowers, and hints of brioche all give way to a medium to full-bodied concentrated, yet elegant Saint-Péray that has good acidity, notable balance, and a great finish. Drink it any time over the coming decade." Johann Michel is a young self taught winemaker who discovered his passion while tasting old bottles of wine with his grandfather. His first vintage was 1997. AOC Cornas is one of the smallest AOC in France (only 116.4 hectares = 288 acres). He now farms 4.17 hectares under "culture raisonnee" (sustainable) method in the lieux dits "Les Cotes", "Bayonnet", "Chaillot" and the parcel called "Saveaux" for the AOC Cornas. Very low yields for all the wines. only 33 hectoliters per hectares for the Cornas tradition.